A new cell-based treatment for type 1 and 2 diabetes could eliminate the need for constant insulin injections for patients. The method showed its effectiveness in mice trials, and the team hopes to test in on human patients within two years. The method uses a capsule of genetically engineered cells which is grafted under the patient’s skin. They monitor blood glucose levels and automatically secret and release insulin when needed. This would lead to more reliable and more efficient treatment to the condition than the ones we use now — where patients administer their own insulin. But we’re still a way off from that. The ETG University team behind the new capsule hopes they will obtain a human clinical trial license for the technology in the next two years, with potential commercialization in the next decade. In 2013, some 24.4 million American adults were estimated to suffer from one form or another of diabetes, and as a rough estimate 10% of them had type 1. This condition usually begins developing in childhood as the body’s immune system starts systematically destroying all the pancreatic beta cells. These cells are the body’s sugar’o’meter, and release insulin to regulate glucose levels in the blood. So without them, patients have to get regular insulin shots or face the risk of hyperglicemia. Type 2 diabetes by contrast, is also usually associated with low levels of insulin but is characterized by high resistance to the hormone. Some type 2 patients also require shots of insulin to keep blood levels in check. But relying on insulin shots is already showing limitations, and the number of diabetes cases is expected to explode worldwide in the next few decades, according to the team. So a more efficient treatment is required. “By 2040, every tenth human on the planet will suffer from some kind of diabetes, that’s dramatic. We should be able to do a lot better than people measuring their glucose,” said lead researcher Martin Fussenegger. Fussengger added that if the technology is green-lighted for human use, diabetes patients could trade daily injections for the implant which would need to be replaced three times per year. It would do a much better job than than the shots which do not perfectly control blood glucose levels leading to complications such as eye, nerve, and heart damage associated with diabetes. Should it pass the trials, the capsule could do a lot of good by treating patients of type 1 diabetes as well as those with type 2 that require insulin shots. Previous efforts have tried to develop methods of artificially growing pancreatic cells from stem cells. Manufacturing these cells en masse has proven difficult, however, and the cells were prone to dying once introduced in the body. “They are prima donnas in the cellular context,” he said. Team thus looked at the more resilient kidney cells for a solution. A type known as HEK cells were grafted with two new genes allowing them to take on the role of pancreatic cells. One of them makes the cells sensitive to glucose levels and the other instructs them to release insulin into the blood after glucose levels rise get too high. They were tested on mice (who were treated so that they lost all insulin-producing cells). The modified HEK cells were then implanted in porous capsules (think of a teabag) that protected the human cells from the mice’s immune response while allowing insulin to flow out. The approach was found to be better at regulating blood-sugar levels than pancreatic cells and remained healthy three weeks after implantation. 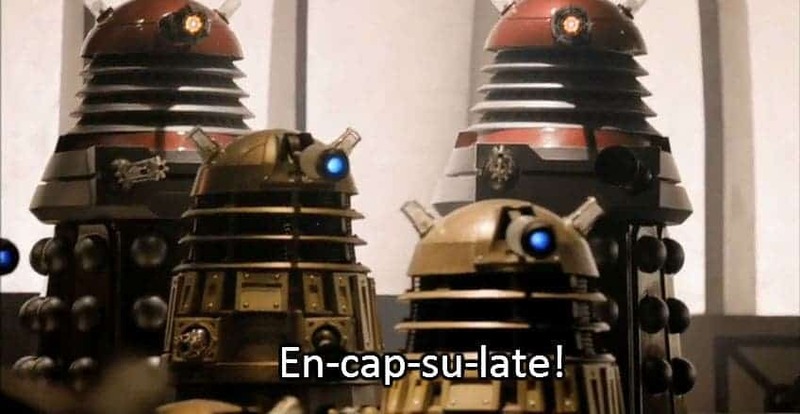 Even the Daleks are excited at the idea. Image modified after Radio Times. In the study, mice were treated such that they lost all their insulin-producing pancreatic cells. The cells were then implanted into the mice, enclosed in a teabag-like porous capsule that protected the human cells from the mouse immune system, but allowed the hormone to diffuse out. One advantage of this approach is that the cells don’t have to be genetically matched to the patient. Capsules could be produced and frozen on an industrial scale, to be used whenever needed. The full paper “β-cell–mimetic designer cells provide closed-loop glycemic control” has been published in the journal Science.